As a mom, of course we will get proud and pleasant when we could give our children good looking dressing. But, something that we should consider is that when we buy them we should consider the children preference. it is not wise when we just buy some dresses because we like them but in fact, our children do not like them. May be they will not be willing to wear them or the will wear them, but they wear them reluctantly. Just imagine, how will we feel when we must wear a dress that we do not like it? So, we should consider the children feeling too :). 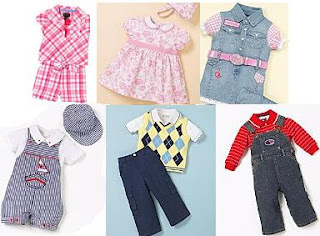 In order that we can buy the appropriate dress that agree with our children prefer, so we can ask them about what kind of dress they would like to, but of course we can give some inputs for them without forcing them to achieve our ideas. Let them decide what kind of dress they would like to. Or, we can also looking for about what their prefer, perhaps about the color they prefer, picture, hobbies, etc. By knowing these preference we can select the appropriate dress for them. The others are about price and place. We should consider about the price by selecting the best place and best price. Why? Just remember that we will buy the dresses for children and we should follow what they prefer, so we should consider about the price and place selecting. What will happen when we have get in the big mall and our children would like to get the expensive ones? in other side, we also has budget for those dresses. SO, we would not like to get over our budget, aren't we? And we also would not like to make our children disappointed, of course. Hence, by selecting the best place in best price, we will get what we want and pur children too. Finally, the other is about the size. In this case, we can select the suitable size for them, but we can also get over size, but the gap just one, yes just one level. Why? the children are groing up so fast. by buying the size that ovel one level of their size, it will help us economically, because the children can wear it until next month, two months, next semester, or maype next year :).